Caia Koopman is a native of California and was born in Livermore. She majored in fine art and earned a B.A. at UC Santa Cruz, California. Santa Cruz turned out to be the place that seduced her to the local skateboarding scene. In addition to receiving an academic education, Caia also learned to skate ramps, streets, pools, and Derby Park. Skateboarding led to skateboard graphics, and her first limited edition team T-shirt design for Santa Cruz Skateboards. Her artwork has been featured in numerous print media including Surfing Girl, Mademoiselle, Details, Girl's Life, Snowboarder Magazine, Teen, Teen Style, Teen People, J-14, Fine , and others. Caia designed T-shirt graphics and promotional illustrations for many companies, such as: Quiksilver/Roxy, Hurley, Op, AT&T, and Casio. Caia's paintings have been used commercially for many years as graphics for snowboards, skateboards and wakeboards for major companies such as K2, Morrow, and Hyperlite. Caia has also been featured on MTV, "mtv sports" as an athlete/artist for her snowboarding and painting. Caia has shown her paintings in a number of galleries around the world and most recently at La Luz de Jesus in LA. She is currently working as a freelance illustrator and painter in Oceanside, CA. Caia is inspired by nature, dreams, politics, and life. Holds three regular tampons. Clean with damp cloth. If item appears scratched, please remove the protective plastic film on the back of each case. Please note, the Tampon Cases - Caia Koopman have been discontinued. When Armistice Tampon Case (left) sells out, it will no longer be available and will be removed from the drop-down. We got these as gifts for some teenagers and they really liked them. I was only able to fit 3 regular size tampons in this. It's very cute and sturdy. My only complaint is that it is too small. Would be better if they increased the width and height to accommodate a few more tampons. This case both serves a purpose and is super cute! It looks great both in and out of my purse....I've shown it to a few of my friends and they love it as well! This was a gift for a friend and she loved it. I saw no flaws with it and it was just as it is in the picture. Very pleased to find something a little different to give. My daughter loves the design of the case and thought it was such a wonderful gift. There is no more digging around the bottom of her purse for a tampon. She said she wished the case was a little bit larger. Perfect stocking stuffer for my 15 year old Granddaughter. The only drawback to the purchase was that I ordered it on 11/17/2012 and didn't receive it until 12/5/2012. Paid $7.95 for shipping so this was ridiculous! It's too small for its intended use and the quality can be better. It's too small to put other things in it. This case is unique and the design is really beautiful. I gave it to a friend for her birthday and she was thrilled. Worth the money. It's a beautiful multi-purpose container that can be used on the go when traveling or for everyday uses. 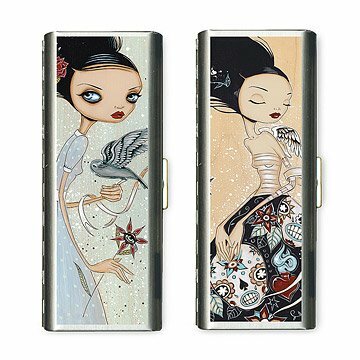 These unique tampon cases feature the artwork of Caia Koopman and feature princesses from a gothic fairy tale that have a rebellious beauty about them.